If you use key words in your post titles and you add them when you name your photos, you have the luxury of using them sparingly in the content of your post. You want to write naturally. You don’t want to stuff your post with key words because it will seem forced and you will annoy your readers. So my first suggestion is to completely ignore key words when writing your post. Write about whatever it is that you want to share and do not think about Search Engine Optimization (SEO) or Search Engine Results Page (SERP). Where Should You Place Key Words? What is the point of your post? Are you sharing a recipe, a tutorial, or showing your readers how to fix a problem? Do you state your intentions? Do you follow through? Do you have a clear topic? If not, is there a way you can link the things you have written about to form a connection and make your topic clear? If you have written about too many unrelated subjects, can you break them up into several posts with clear topics? Are your essential points easy to find? If not, can you bold key phrases? Would your post be easier to understand if you used headings to outline the essential points? The answers to the above questions are going to point you to where you want to place key words if you have not already done so. Use key phrases to introduce your topic, make your point, bold them, and include them in headings. However, you must do it naturally, in a way that flows and engages your readers in the subject. Your first priority is to your current readers; your second priority is to people searching on your topic. I can’t say this strongly enough: Don’t sacrifice your current audience, for a potential audience. How Do You Choose Key Words and Phrases? Ask yourself what is it that searchers need to know about your particular post or recipe. What distinguishes it from similar content? How are you helping your readers by sharing this information? Are you sharing a recipe made from scratch to avoid an ingredient contained in the processed version? Is your adaptation healthier than the typical recipe for that item? Is your recipe more frugal than a packaged, store-bought version? Have you simplified a traditional recipe? Keep asking yourself questions until you have figured out what is unique about your post and why your readers should make your recipe instead of one of the other variations that are out there. The answers to the above questions will provide you with the key words and “long chain” phrases to use in your post. By helping your readers understand why you chose to share a particular recipe, you are making it easier for searchers to find it. You may find this article on how to Build Keyword Density the Right Way helpful. Sometimes using synonyms helps you broaden your reach through a variety of key words. And synonyms can make your article more interesting for your readers, but there aren’t a lot of synonyms for squash. There is a difference between word stuffing and genuinely only having one word that works for a particular recipe. 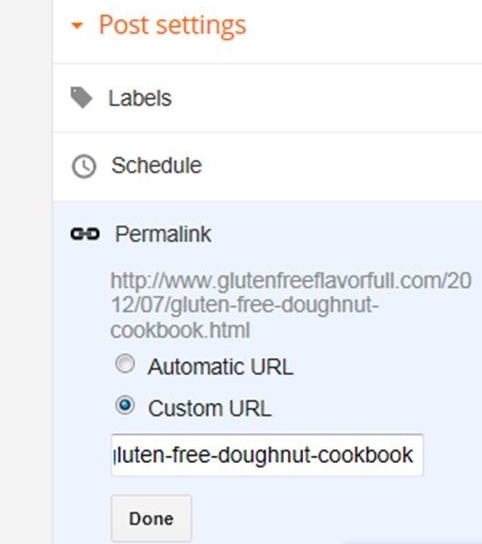 You can make it easier for your readers to follow your recipes while making it easier for search engines to recognize your recipe in your post. 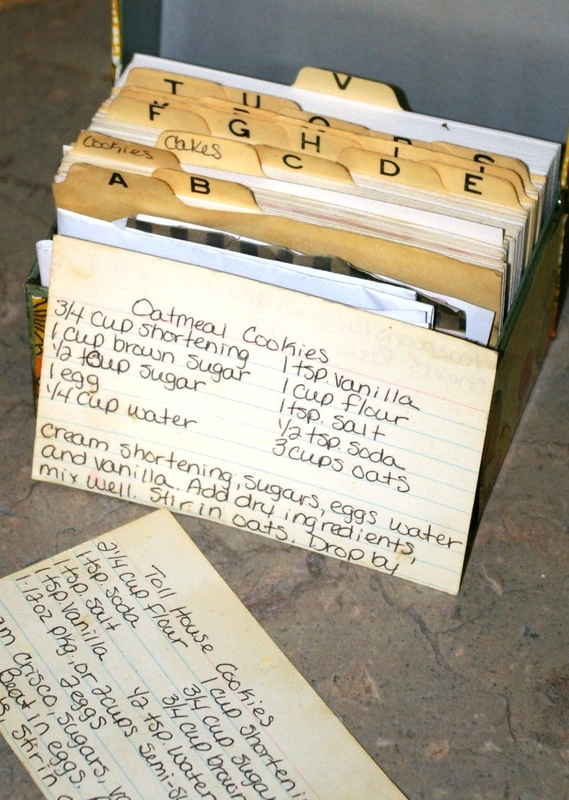 Put your recipe title in Heading 1 or Heading 2 (Or use the default heading in blogger). If possible, only put one recipe per post. If your main recipe includes a sauce or frosting, define that recipe with a subheading in both the ingredient section and the instructions. You should include the following terms: Ingredients, Directions (or Instructions), Prep Time, Cooking Time, Total Time, and Servings. The terms ingredients and directions (or instructions) should be in bold. List your ingredients in a bulleted list, one ingredient per line. List your instructions in a bulleted or numbered list. Do not put them in a paragraph! Use one line per instruction, even if your instructions are very short. Be wary of anybody who tells you they have a proven recipe for SEO. It isn’t an exact science and the algorithms are constantly changing. And what works for one blogging community will not necessarily work for another niche. So watch your “came from” and “keyword activity” stats to figure out what works for you. Generally, if you make your posts and recipes easy for your readers to follow, you will also make it easier for search engines to find you. You have created a delicious recipe. You made your hungry family wait while you photographed it from every angle. You wrote a charming post with a traffic boosting title. You even spell checked your post. You’re ready to hit publish. Wait! Did you name your photos? If you are like most food bloggers, you have probably overlooked this simple step. And naming your images wisely has the potential to move your post to the head of the line in Google searches. In the above image, you can see that some of my traffic is coming from Image Searches on Google. People don’t just want a recipe, they want to see what the final product of that recipe, and many people want to see it as early in the search process as possible so they use Google images. Scroll over some of the pictures on your blog posts. When you scroll over the image a box will pop up with the image’s name in it. What does it say? June2010(35).jpg is not a good name. Neither is PBCookDec15.jpg. and IMG_1828.jpg tells you nothing about the photo. Now edit the photo, what is written in the alternative text field? Is it blank? We need to fix that right away! Take the Time to Rename your Image! After you crop your picture in your photo editor, rename it with a name that uses key words from your post or recipe. When you hit save in Pixlr or PicMonkey, it gives you the option of changing the name of the photo. Use a keyword rich name now! You may find the “rename” option under properties in your photo editor. If you cannot find the rename option anywhere on your photo editor, simply click on “save as”, rename your photo, and then save it as a jpeg. 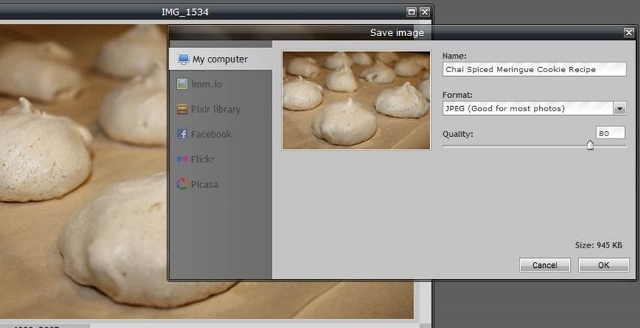 Using Pixlr, I changed the image’s name from IMG_1534 to Chai Spiced Meringue Cookie Recipe. You don’t need to overload your image name with key words, just put in enough to help a searcher find your recipe in an image search. Google’s image results appear differently than Google’s other search results. You can easily scroll through many pages of image results, instead of having to click on a new page for every 10 results. So this means that even if your images are much further down in the search results they are more likely to be seen and will do better than if they were in the same position in Google’s Web results. Don’t name all of the images in a post the same name with a number after it (peanut butter cookie (1), peanut butter cookie (2), etc.) Instead use the opportunity to share slightly different variation of the key words from your post to capture more searchers. 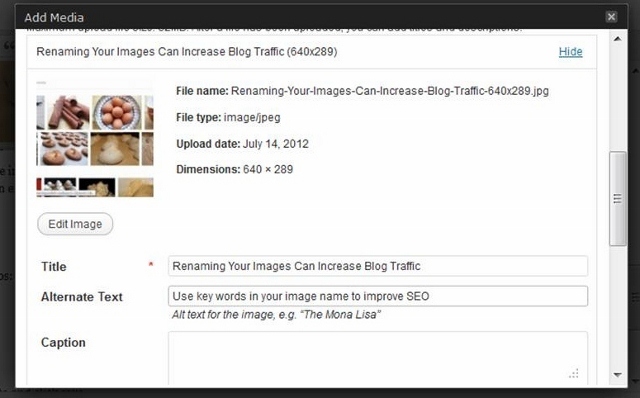 If you use Blogger, you can also add more key words by adding a title and alternate text to your image. Click on your picture while you are in edit mode. A tool bar will appear below your picture. Click on properties. Then fill in the title and alternate text fields. Press OK. If you blog using WordPress, you have another chance to add key words to your image by filling out the Title and Alternate Text fields when you upload images to your blog. Make sure you fill out the alternate text fields when you load images to your WordPress blog. Although Google doesn’t read the image title, some pinning apps pull it and use it as the title of the pin, so go ahead and fill it out. As I stated before, you don’t want to overuse key words or stuff your images full of key words; just use those fields to share what is truly relevant to those doing a Google Image Search. You know some of your posts are gems and you’ve shared some great recipes, so why aren’t more people showing up to your blog? Your titles are catchy. They’re interesting and funny. And that could be part of your problem! If you want more traffic for your food blog, you need to make it easier for people to find your content while doing a Google search. Catchy titles might actually make it harder for people to find your content. Your title will not help you in Google searches unless it contains the words that people use when they are searching on a topic. If you used a play on words or song lyrics or put a hook in your title, you may be accidentally sabotaging your blog. And if your funny title does generate some traffic, those viewers might have been looking for something funny and be quite disappointed with a recipe for broiled tomatoes. In real life I am a goofball and that crops up at the oddest times when I blog. In the early years, it often appeared in my post titles. I would write a totally serious post and then on a whim give it a ridiculous title. Which is how my post on making French Vanilla Creamer ended up being called “Making Your Own Legal Stimulants“. My regular readers didn’t have a problem with my title and even shared it with their friends, so I received a little traffic. But a few weeks down the road, I started noticing traffic coming from Google searches for “how to make legal stimulants”. I am pretty sure anyone who arrives at my creamer post from a search on stimulants is very disappointed. Since those people are not finding what they are looking for, they are not going to look through my other posts and they are certainly not going to subscribe. Three years after sharing my creamer recipe, I decided to share it again. This time I kept all of my goofiness inside my post and even though it contains at least one drug reference, I named the post Homemade French Vanilla Creamer. I realize that most of the people who arrive through Google searches skip over my silly story and go right to the recipe, but that is okay, because they find what they are looking for, like it enough to share the post, they view my other recipes, drop me a note, and occasionally subscribe to my blog. If you have been around the blog world for any time then you have heard the term Search Engine Optimization (SEO) bandied about. SEO refers to a web site or blog page’s visibility in search results. The higher your post comes up in search results, the more likely it is to receive traffic. For a long time both of the posts I mentioned above were in the first 10 results produced by a Google search using terms in the post titles. Being in the top 10 seems like a good place to be, but it isn’t if you are there based on key words that do not match your post’s contents or your blog’s philosophy or mission. Many bloggers use a device, technique, or hook in their articles’ titles because they are trying to stand out from the pack. Or they are trying to create “buzz”. As food bloggers, we don’t have to do that. Growling tummies create more than enough buzz and while some recipes are seasonal, food never goes out of style. Everybody eats, but few people know how to cook, so we don’t have to worry about our niche becoming overpopulated. We just have to worry about helping people who like our cooking style find us. Every day millions of people are searching Google to figure out what to make for dinner that night. If you have buried your potato salad recipe under the title “A Walk in the Park” and a post about a family picnic, those people searching for a potato salad recipe are not going to find it on your site. You have to make a decision: Are you a food blogger who shares stories with your recipes or are you a lifestyle blogger who peppers your stories with recipes. If you are the former, own it and give yourself permission to title your posts with recipe names, i.e. Easy Potato Salad, Italian Potato Salad, Potato Salad with Zucchini, or Old Fashioned Potato Salad. The words, terms, and phrases that people enter in the box when they search on a topic are referred to as key words. When you select a title for your posts, think about what your post contains that people may be searching for and work those words into your title. You don’t have to use a formula and it doesn’t have to be a perfect match, but your post title should convey the essence of what is important to a searcher in your post. If I had put some thought into my post title on creamer, I would have named it “How to Make French Vanilla Coffee Creamer” because it contains more of the words people use when searching for how to make coffee creamer and allows for more combinations of those words, but the second title is good enough to be of use to searchers. You don’t need to stress too much about trying to get titles perfect because there are still opportunities to use key words in the post (and I will talk about those later this week). Just take a minute before you hit publish to reflect on whether your title will help someone find your recipe. If your blog is on WordPress you can do a couple of things to tinker with your title and improve SEO. The first thing you can do is edit your title. Do you refer to your potato salad as Grandma’s recipe. 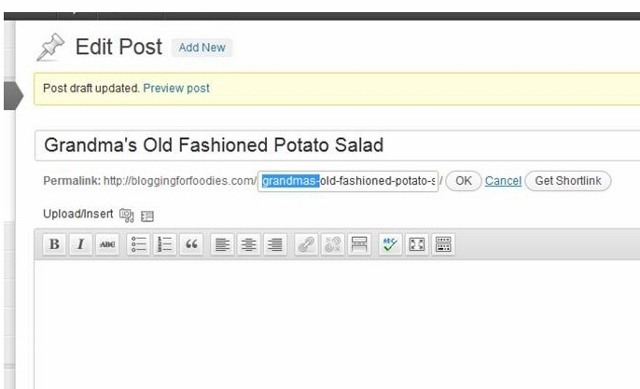 Go ahead and call your recipe by its name in your post title, but then edit out the word Grandma in your permalink, since “grandma” is probably not going to be included in any Google searches for potato salad. Write your post title. Then hit Save Draft. Underneath your post title is the Permalink. Click on the edit button at the end of the permalink. Highlight the words you want to remove, plus any excess dashes and hit the delete button. Now click on the OK button and you have a new permalink. If you are using WordPress, you can also use the All in One SEO Pack Plugin to change how your post looks in search engines. If you are new to WordPress this is a great tutorial on how to implement the All in One SEO Pack Plugin. Since many people include the word “recipe” in searches for recipes, I use the All in One SEO Pack to add Recipe to my title in search results. I can also include information in the description to help searches see what is unique about my recipe or see that it includes certain ingredients or avoids allergens. The latest version of Blogger allows you to create a custom permalink. Thanks Micha of Cookin’ Mimi for sharing this tip in the comments! To edit your permalink, click on Post Settings (on the right side when editing your post). Scroll down and click on Permalink. Although I am not sharing a recipe today, I still followed my advice for writing a post title. I didn’t succumb to my desire to use “A Tale of Two Posts” as my blog title, instead I summed up the essence of what this post is about in my title. I reread the post and thought I sounded a little bossy, since I’m too lazy to go back and change my tone I decided to phrase the title in the form of a directive. If you want input as you create blog titles, ask for help from fellow foodies on the Blogging for Foodies Facebook Page. Confession time: What is your craziest post title? Make me feel a little better about my “legal stimulants” and share your wildest post title in the comments.